A dolphin can be a great friend after all. 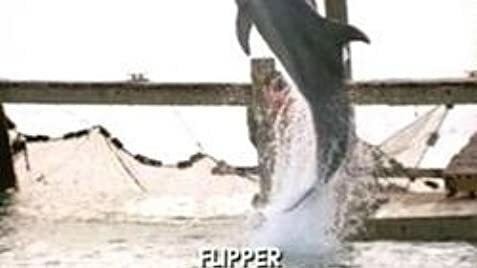 This is a spin off of the TV series Flipper. But I don't remember much about the TV series so I don't know the difference from one another. This is about an average boy teenager named Sandy. Who is spending the week with his Uncle which he's unaware on what he's like. Sandy isn't too excited in seeing him because he really wanted to go to a Red Hot Chilly Peppers concert. His uncle is Porter an Austrailian/American seaman who enjoys fishing for a living. And lives in a rigidly old hut that might not look to satisfying to guests. Sandy finds it unbelievable that he's related to this guy. things seem boring till he encounters a dolphin who is very playful. Sandy finds a new friend to be with through out his vacation. This movie isn't too bad. Cool thing is it had Ejiah Woods as Sandy and Paul Hogan as Porter. I recommend it for 8 and up. Rent it first before buying it. Porters truck is a 1948 Chevrolet 3100. Sandy Ricks: You're lucky, a hurricane on your first visit. When the boat is bearing down on the boy near the signal marker, the tracking radar shows it ahead of the boat but off to the right, at about the one o'clock position. As they close in on it, the distance on the radar gets shorter but it stays at the one-o'clock position. If they were heading straight toward it, it would be at the twelve o'clock position.